Minoh is best known for Meiji no Mori Minō Quasi-National Park, one of Japan’s oldest national parks, which has a picturesque waterfall and a large population of wild monkeys. Minoh is a popular sightseeing place all year round, but in autumn many people visit the area to see the colourful Maple leaves. 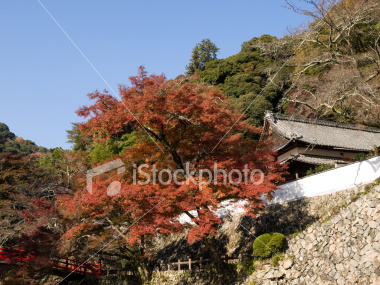 Traditional kendo doujou martial arts training place on the side of the mountain with autumn coloured trees and stone wall and near the famous Minoh waterfall sightseeing spot. 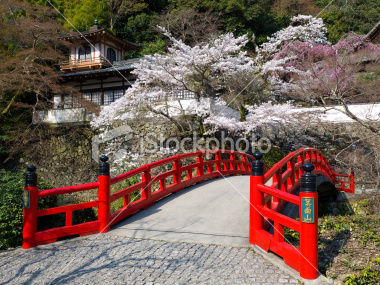 Red wooden bridge and traditional old building on the mountain side with spring cherry blossoms near the famous Minoh waterfall sightseeing spot.